WAUKEGAN, IL, DECEMBER 19, 2017 – AMETEK Powervar, a leading supplier of power conditioning and uninterruptible power supply (UPS) solutions, is proud to announce that its Security Plus UPS system has been approved for use with SCIEX mass spectrometer instruments. SCIEX, is a global leader in life science analytical technologies. As part of a Global Resellers agreement, AMETEK Powervar’s Security Plus Series is being showcased at the SCIEX Customer Demonstration Facility in Framingham, MA. The partnership solidifies a long-standing relationship between AMETEK Powervar and SCIEX. AMETEK Powervar’s Security Plus UPS provides mission-critical, high -quality, conditioned uninterruptible power to SCIEX LC-MS mass spectrometers and the complete range of SCIEX RUO LC-MS systems. The Security Plus UPS offers SCIEX customers power protection for systems with high crest factors and high current inrush peripherals, avoiding over sizing. This translates to lower lifetime costs for a higher value power protection investment. 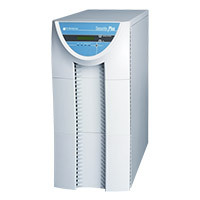 The Security Plus UPS is a high-frequency, double-conversion intelligent UPS, designed to handle the dynamic loads of analytical instruments. Product sizes range from 2 kVA to 15 kVA. Customers can custom design the output receptacle panel and input line cord for quick and easy on-site connection to equipment. The Security Plus UPS touts an impressive 0.9 output power factor, low-impedance isolation transformer, and low-input THDi. It allows wide input voltage and frequency window via an online inverter. AMETEK Powervar is a global provider of power management systems. It is headquartered in Waukegan, IL, and has international sales and service offices in the United Kingdom, Canada, Germany and Mexico. Primary products include transformer-based power conditioners and uninterruptible power supplies that support a plethora of diverse vertical markets. For more information, visit powervar.com.